The committee’s major role is to advise the Society and its leadership on public policy issues related to cell biology and the basic biomedical research community, with attention to research funding and relevant science policies. 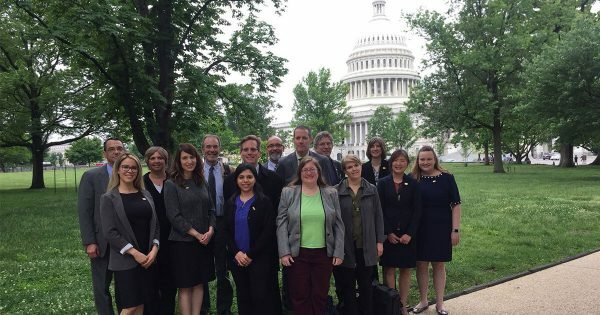 The committee, its members, and staff meet with Members of Congress and other government officials to educate them about implications of proposed policy measures on the cell biology community, and provide advice on funding priorities and other matters relevant to cell biology. The committee is also responsible for educating ASCB members on grassroots advocacy activities and alerting them to advocacy opportunities. ASCB Leadership Hill Day - After the ASCB Council and leadership meet in Washington, DC each summer, ASCB leaders spend a day meeting with members of Congress and their staff discussing issues important to the ASCB community. Advocacy Training - At each ASCB| EMBO Annual Meeting, the Public Policy Committee sponsors training session on important tools scientists need to improve their advocacy skills. Public Service Award - The Society’s highest honor for public service, selected by the ASCB Public Policy Committee. The ASCB Public Service Award recognizes outstanding national leadership in support of biomedical research. Committee membership is open to regular members and postdocs. Full members serve three-year terms renewable one time. New members can serve one year terms as Associate members before being considered for full membership. Committee members are expected to regularly participate and be engaged in committee activities and have a genuine interest in the mission of the committee. Prior experience in science policy and science policy advocacy is an additional benefit. Members participate in monthly video meetings and one in-person meeting held during the ASCB/EMBO Meeting. Additional activities include participation in taskforces, subcommittees, and email as needed. Those interested in being considered for membership should submit a CV and a one-page statement of interest that includes policy-related areas of interest, past experience in science policy, and experience science policy advocacy. Applications are considered each fall. Questions about committee membership? Send an email to ascbinfo@ascb.org.